Douglas Hill's books are classics of horn pedagogy; his playing, compositions, and teaching are aimed at extending students' and colleagues' imaginations; and he has served the horn community as soloist and clinician and IHS Advisory Council member and President. Doug was born in 1946 in Lincoln, Nebraska. His varied musical interests (including jazz bass, and composition) were largely initiated and nurtured by his junior high school music teacher, Kenneth Freese. During his high school years, he solidified many of his horn playing techniques while studying from Jack Snider, Professor at the University of Nebraska. He earned a BM and a Performer's Certificate at Indiana University, studying horn with Philip Farkas, and later an MM from Yale University with Paul Ingraham, with whom he performed often in the New York City and Joffrey Ballet Orchestras. 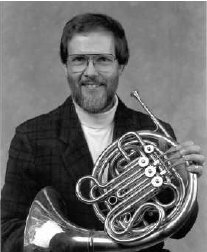 Doug has served as professor of horn at the University of Wisconsin since 1974. He began there performing and recording with the Wingra Woodwind Quintet and now performs and records with the Wisconsin Brass Quintet. After graduation from IU, Hill played solo horn with the Rochester Philharmonic, New York City Ballet, Contemporary Chamber Ensemble of New York, Aspen Festival Orchestra, Henry Mancini and Andy Williams Orchestras, and for 30 years with the Madison Symphony. He was an original member of the Spoleto Festival Brass Quintet and has performed with the New York and American Brass Quintets. Previous faculty appointments include Oberlin Conservatory, Aspen Music School, Conservatories of Music in Beijing and Shanghai, the Asian Youth Orchestra, Wilkes College, University of South Florida, Sarasota Music Festival, Yale Summer School at Norfolk, the Asian Youth Orchestra in Hong Kong, and the Kendall Betts Horn Camp. He recently served as the Wind and Brass Adjudicator and Chair of the Classical Music Division for the National Foundation for Advancement in the Arts, as a judge for the Fischoff and Coleman Chamber Music Competitions, and on the judging panel for the first International Horn Competition held in Toulon, France. Hill has appeared as soloist and clinician throughout the US, Germany, France, and China, including numerous international, national, and regional brass and horn workshops and symposia. Doug's extensive publications include Collected Thoughts on Teaching and Learning, Creativity, and Horn Performance (2001), Extended Techniques for the Horn (1981/1996), Introducing the Instruments: Horn Home Helper (2005), Warm-ups and Maintenance Sessions for the Horn Player (2002), High Range for the Horn Player (2005), From Vibrato to Trills to Tremolos for the Horn Player (2004), dozens of articles, scores of original compositions and pedagogical etude books, the educational video/DVD Hill on Horn, and three solo recordings and a variety of orchestral and chamber ensemble recordings including Thoughtful Wanderings: Compositions by Douglas Hill, featuring alumni, faculty, students, and staff of the UW School of Music. As a frequent recipient of research grants, he has studied unrecorded horn and piano repertoire, extended techniques, hand horn, extemporization, and compositional techniques and applications. Douglas Hill served on the IHS Advisory Council from 1976-82 and 1994-97. He was elected IHS President for three years beginning in 1978. During his tenure the society created its Articles of Incorporation, solidified its Constitution and Bylaws, developed the Communications Network of regional coordinators and area representatives, hired its first executive secretary, fully developed its composition contest and commissioning projects, and tripled its membership. Hill was elected an IHS Honorary Member in 2008 at the 40th International Horn Symposium, where - appropriately - he performed, served as moderator for four panel discussions on pedagogy, led his university horn choir in concert, and heard his Set of Songs and Dances performed by Gail Williams and his Jazz Soliloquies performed by Bernhard Scully just hours after the honor was announced.